The Congress today countered the BJP’s campaign against the UPA-Left Presidential nominee by hitting out directly against the NDA-backed candidate Bhairon Singh Shekhawat as it dredged up old published reports containing charges against him. In another move to attain high moral ground vis-a-vis his opponent Pratibha Patil in the presidential election, vice-president Bhairon Singh Shekhawat is likely to declare his assets tomorrow. The Majlis Ittehadul Muslimeen (MIM), an ally of the UPA, has decided to abstain from voting in the Presidential poll as a mark of protest against the UPA-Left candidate Pratibha Patil's controversial remarks on veil system. With China factor in mind, India and Vietnam today established a strategic partnership. And as India looks to the East, Prime Minister Samdech Hun Sen of Cambodia comes calling this weekend. The Delhi High Court today stayed the attachment of two brigadiers for facing disciplinary action for their alleged roles in irregularities in procurement of supplies. The bench, comprising Justice T.S. Thakur and Justice S.N. Aggarwal observed that the court of inquiry (COI), on the basis of which the Army issued attachment orders, had been set aside by the court earlier. Describing UPA as a ‘confused alliance’, BJP today accused central ministers of giving contradictory statements on sensitive issues like terrorism. Former Prime Minister Atal Bihari Vajpayee today took a dig at the Indo-US nuclear deal by casting doubts on the recently constituted three-member task force by the UPA government for reviewing country’s existing policy on disarmament, non-proliferation and other related security issues saying it had been set up to change country’s well established policies on these issues so that they conform to the Hyde Act. Torrential rains today sent rivers in some parts of West Bengal that swept away two persons and marooned hundreds, leading to the Army being called out for rescue operations. The Masjid-i-Khuda Dat is the dominating structure opposite the house of the Ahmed brothers, who have been linked to the terror attacks in Britain. However the mosque, whose practitioners claim they are preaching a tolerant form of Islam, did not apparently influence the brothers. In a tragic culmination of a 50-hour ordeal, a six-year-old boy, who fell into a borewell while playing at a village, 35 km from here, was pulled out tonight but found dead. A cheque of Rs 10,000 issued by Yavatmal district collector to a farmer’s widow under the Prime Minister’s Relief Fund has bounced for lack of funds. Seven days after his ‘body’ was recovered, the abducted Food Corporation of India (FCI) executive director Dr P.C. Ram today talked over the phone to his son Pravin Ram and other family members at Ghaziabad. A noted India-born AIDS researcher in the US says that defective or sub-standard medical kits supplied by the government’s National AIDS Control Organisation (NACO) for testing HIV in different blood banks and hospitals in India has put a large number of Indians at serious health risk. Indians love to talk. Mobile operators, perhaps, may not agree to if the latest quarterly figures released by the Telecom Regulatory Authority of India were any indications. India will go in for Bus Rapid Transport System (BRTS) to remove congestion in its major cities with the Centre already approving such systems for the cities of Hyderabad, Nagpur, Indore and Pune. Preparations on for Juhi Babbar’s grand reception. The Congress has so far maintained that unlike the BJP it will refrain from attacking Shekhawat personally since it did not want to lower the dignity of the high office of the President. However, the party has been forced to change tack in the face of the BJP’s unrelenting campaign against Pratibha Patil. Dropping all pretence, Congress spokesperson Abhishek Singhvi today referred to a series of published reports, which had named Shekhawat personally for irregularities committed during his tenure as Rajasthan Chief Minister. He said while there was no official document or enquiry report that had implicated Pratibha Patil personally, there were innumerable reports containing serious charges against Shekhawat. “These are all in the public domain,” Singhvi remarked. after he took over as Chief Minister. Singhvi also recalled a serious land scam involving Shekhawat and his son-in-law, which had rocked the Rajasthan Assembly. Confronted with these allegations, Shekhawat promised a CBI probe but it was subsequently revealed that he never referred the matter to the Centre at all. The Congress spokesperson said this was only the tip of the iceberg as the list of charges was lengthy. Taking a dig at the Vice-President, Singhvi pointed out that when patriotic Indians were leaving their jobs to join the Quit India movement launched by Gandhi in 1942, Shekhawat had joined the police force, only to leave it after the country attained independence. “I wonder what kind of principles and ideals had motivated Shekhawat,” Singhvi asked. An indication to this declaration came in response to a question on the Election Commission's rejection of leader of the Opposition L K Advani's appeal for making assets of the presidential candidates public when NDA spokesperson Sushma Swaraj said the time to answer this question had come and "I will say something on this tomorrow". Shekhawat's move comes in tandem with the NDA strategy to turn the presidential contest into a battle of "good and evil", a senior NDA leader said and added that the issue here was not of winning or losing but it was an attempt to capture the popular mind for the electoral battles in 2008 and 2009. That is why Advani and the entire NDA is stressing the conscience vote, he pointed out. Earlier, Swaraj lashed out at CPM Politburo member Sitaram Yechury who had questioned Shekhawat's role during the Quit India Movement asking the CPM leader to explain the Left's role between 1942 and 1962 when the "comrades" sided with the British and opposed freedom and refused to term China as an "aggressor" in the 1962 Sino-Indian war. The MIM, which has five MLAs and an MP constituting 1,300 votes in the electoral college for the President's post, took the decision at a meeting of its executive committee here last night. Accusing Patil of hurting the sentiments of Muslims, it said: "Her remarks constituted an unwarranted interference in the Muslim personal law. Her clarification on the issue is not satisfactory." Participating in a function at Udaipur on June 17, Patil, who was then the Governor of Rajasthan, had remarked that "purdah" system began after the Mugal invasion to protect women from the aggressors and called for putting an end to the practice in tune with the changing times. With China factor in mind, India and Vietnam today established a strategic partnership. And as India looks to the East, Prime Minister Samdech Hun Sen of Cambodia comes calling this weekend. He will hold talks with Prime Minister Manmohan Singh on July 9. 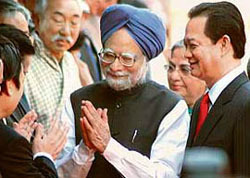 Manmohan Singh and his visiting counterpart from Vietnam, Nguyen Tan Dung, signed a joint declaration on establishing a strategic partnership between India and Vietnam. Both countries are wary of China as they had faced Chinese aggression. The declaration seeks to diversify and deepen the bilateral relationship in rapidly changing environment. It will encompass bilateral relations in the political, economic, security, defence, cultural, science and technological dimensions and steer their cooperation in regional and multilateral fora in years to come. Some of the salient features of the declaration include establishment of a strategic dialogue, a joint working group on countering terrorism, closer defence cooperation, India’s commitment to assisting Vietnam through grants and concessional lines of credit, a joint commitment to working together to establish an Asian community and expansion of bilateral trade, enhancement of science and technology and cultural cooperation and closer cooperation in multilateral fora. According to the attachment orders received on July 4, Brig. P.S. Gill and Brig. S.K. Handa were to report to Headquarters 1 Armoured Division, Patiala, on July 10. Brig. Gill, who is approved for promotion to major general, is posted at the Army Training Command in Shimla, while Brigadier Handa is posted in the Supplies and Transport Directorate at Army Headquarters. Counsel for the petitioners, Maj K. Ramesh (retd) told The Tribune that the tentative charge sheet to be served to the two officers by the General Officer Commanding 1 Armoured Division on their attachment had to emanate for the same COI which had already been quashed by the court for violating provisions of Army Rule 180. The Army had ordered a COI in 2005 into alleged irregularities in the procurement of frozen meat for troops based in the northern sector. The COI had held the then director general (supplies and transport), Lt. Gen. S.K. Sahni, and several other senior officers, including the two brigadiers, blameworthy for their alleged acts of omission and commission. Disciplinary action, entailing possible trial by general court martial, was ordered against Gen. Sahni, who retired in September last year. He was ordered to be attached to Headquarters 2 Corps for hearing of charges. On a petition filed by him in the Delhi High Court, the COI was quashed in January this year with directions to the Army not to proceed against him on the basis on the COI. The Army, however, was free to initiate fresh investigations. General Sahni had contended that Army Rule 180, a procedure to be invoked when the character and military reputation of a person is involved, was not complied with during the COI proceedings. Gen. Sahni, in his petition, had also contended that there were several other infirmities and incorrect statements in the COI and related proceedings. “The court had quashed and set aside the COI and if this be the admitted position then whether the Army can discriminate the petitioners out of the same cause of action and in the same circumstances is an important issue,” Maj. Ramesh contended. “On the contrary the Army HQ should have applied the judgement in rem to all the officers placed in the same situation in the same COI,” he added. “UPA is not United Progressive Alliance… it is united confused alliance. Its ministers are confused and voice contradictory opinions,” BJP president Rajnath Singh alleged at a party function here. Accusing UPA of attempting to divide the society on religious grounds, the BJP chief threatened to strongly oppose any move to offer reservation on the basis of religion. “I assume that Muslims will also agree to it. They should strongly oppose reservation on the basis of religion and promote it on the basis of financial status,” he said. Condemning the Indo-US nuclear deal, he claimed the previous NDA government at the Centre had effected nuclear tests despite international pressure against it. On the other hand, UPA has accepted to ink an agreement with the US, which will force the country to seek its permission for every nuclear test in future, he alleged. In a statement prior to the visit of a high level delegation headed by National Security Adviser M.K. Narayanan to the USA, Vajpayee said the setting up of this task force at this juncture was nothing more than a thinly veiled move toward reversing our nuclear related policies with a view to bringing them in conformity with the highly objectionable provisions of the Hyde Act, and then to pretend that the changes had been undertaken by us autonomously. Naryanan and foreign secretary Shiv Shankar Menon are going to the USA after 10 days to end the stalemate on couple of issues related with the Indo-US nuclear deal and are understood to be carrying a draft which could remove the hurdles on the way of 123 Agreement. Stressing that no bilateral agreement with the USA should be concluded unless Parliament has had a chance to discuss it thoroughly in order to ensure that it conforms to the assurances given to Parliament last year by the Prime Minister, Vajpayee said the “least I expect the government to do is to explain its position on all these issues and set our doubts at rest”. Lashing out at the Hyde Act, Vajpayee said the Act had been designed to stymie the development of India’s nuclear weapons capability. Two elements of the Act were going to have the greatest adverse impact on our national security and these pertained to banning nuclear tests by India and its “working actively with the USA for the early conclusion” of a multilateral Fissile Material Cut Off Treaty (FMCT), the former Prime Minister pointed out. While India had long maintained a voluntary moratorium on conducting nuclear weapons tests, it had done so as all other nuclear weapon states as well as Pakistan were also observing a similar moratorium, he said. He asserted that “we are, at present, free at any time to resume testing, which may become necessary particularly in response to actions of other countries”. “Once the nuclear deal comes into effect, the Hyde Act will ensure that India loses forever its option of conducting a nuclear weapons test, even if any other country tests”, Vajpayee pointed out. “It not only makes Indo-US civil nuclear cooperation contingent upon India not testing but also envisages that the USA could insist on the right of return of nuclear materials and equipment given to India,” Vajpayee said. A young woman in Narayangarh and a man in Sankrail in West Midnapore (West Bengal) were swept away by floodwaters. The deep depression, which was centred about 50 km from Kolkata, moved westwards causing heavy showers and inundating several areas in the Ghatal block and throwing out hundreds of people from their dwellings. Swollen rivers - Kansai, Kapaleshwari and Keleghai - posed threat to areas adjacent to their banks, officials said. Relief minister Murtaza Hussain said the Army had begun rescue and relief operations in the flood-hit areas. The situation in Panskura was alarming due to a breach in the Kelaghai’s embankment, he said. The weather office in Kolkata said “heavy to very heavy rainfall” was expected in districts in Gangetic West Bengal because of the depressions moving further in a west-northwesterly direction. West Bengal finance Minister Asim Dasgupta told mediapersons that besides Army personnel, IAF choppers were pressed into service to rescue nearly 2,000 people who had been marooned in West Midnapore and Bamkura districts. The state government has sanctioned Rs 12 crore for rescue and relief operations in the districts of East and West Midnapore, South and North 24 Parganas, parts of Purulia, Bankura, Hooghly and Howrah and Kolkata. About 6,500 persons were sheltered in 67 relief camps opened in the districts. Met office chief in Kolkata G C Debnath said under the influence of the depression, heavy rains were also expected in north Orissa. Vast areas of Orissa’s Balasore and Mayurbhanj districts were submerged and water level in Subarnarekha rose sharply, prompting the authorities to go on alert. Bangalore: The Bangalore connection in the terror plots in the UK is growing by the day with the Glasgow bomber, who was earlier identified as Khalid Ahmed, today being confirmed to be Kafeel Ahmed, a brother of Dr Sabeel Ahmed, who is already being questioned for his role in the attacks. There are also reports that two friends of Sabeel, a Pakistani and a Palestinian, have fled the city after reports of the terror attacks in Britain surfaced. The Ahmed brothers, in fact, tried to influence the devout at the mosque to adopt a more hardline form of Islam according to the tenets of the Tabligi Jamaat sect. Both brothers are said to be different from other devout, mosque secretary Samiullah told TNS. The brothers also styled themselves differently and did not wear the traditional cap while praying at the mosque, Samiullah said, adding that it created resentment among other devotees. Apparently, the Ahmed brothers were influenced by the Arab views on worshipping and did not like worshipping before “dargahs” which they said were against the tenets of Islam. They also espoused puritanical ideas of the Tabligi Jamaat. They also asked their friends not to eat meat or even smoke or take too much tea or coffee, he said. However, no one in the locality has a bad word to say about either Kafeel or his younger brother Sabeel. In fact, Samiullah’s contention is also challenged by some who say the brothers were only trying to bring in reformation in their locality and that it did not amount to teaching extremist ideas. Wasim, a neighbour, said both brothers were always respectful to the elders of the locality and acted as mentors for youngsters who also aspired to become professionals like them. It is these people who are baffled as to how such educated persons could be involved in terror plots. A few others point to the fact that both brothers have lived in Iran and Saudi Arabia in their childhood and that this stay could have left an impression on them. Meanwhile, the police is pursuing whether the Ahmed brothers had recruited any youngsters into the Tabligi Jamaat sect and whether this cell is active in the city. The background of the friends of both brothers as well as their relatives is being put under a scanner to ascertain their religious leanings. Amidst heavy rains, rescuers from the Army and civil administration took out the boy, Suraj Banzara, from inside a 13-foot piece of rusted iron pipe of eight inch diameter where he had remained stuck ever since falling into the borewell. Vandana Anil Shende, whose husband had committed suicide on August 23 last year was handed over a cheque of Rs 10,000 on February 7 by the collector towards partly providing her with financial assistance under the Prime Minister’s National Relief fund, president of NGO Vidarbha Janandolan Samiti, Kishore Tiwari said. The cheque deposited with District Central Co-operative Bank, Yavatmal, bounced with the bank informing Shende about the fund insufficiency on June 29 in a note, he said. He also made available copies of bounced cheque and intimation to account holder from co-operative bank to the media. Tiwari also demanded immediate suspension of Yavatmal collector, who issued the cheque. Assam police inspector general (Special Branch) Khagen Sharma confirmed that Dr Ram, who is still in the captivity of the banned ULFA insurgents, talked to his Ghaziabad based family over phone from an undisclosed place. The police official said it might be possible, given that the ‘body’ that was exhumed from a paddy field at Anandapara in Baska district by police, was in a semi decomposed state, making it difficult for identification. It may be mentioned Dr Ram’s maid servant Junu Murmu and his son Pravin Ram had identified the ‘body’ as that of Dr Ram’s. Even a large number of colleagues from the FCI, who had seen that body, didn’t raise any doubts. However, the banned ULFA, through an emissary, had informed the state government that it was not the body of Dr Ram who was still in its captivity in good health. Senior cabinet minister Dr Bhumidhar Barman today informed that the ULFA commander-in-chief Paresh Barua had sent a message in this regard. Kunal Saha, the researcher-based in Columbus, Ohio, was appointed by the World Bank to investigate allegations of sub-standard HIV testing kits being distributed in India. Now he is all set to expose the scam after having obtained permission from the bank to go public with the findings about “the bogus HIV testing kits supplied by NACO and used by hospitals across India,” Saha said. Saha and other members of the World Bank team discovered that that there was “fraud” in distribution of HIV testing kits that has put Indian patients in serious danger of contracting AIDS from contaminated blood, he said. “In a letter, the World Bank has informed me that they have no intention to restrict me from my ethical obligation (as a medical doctor) ‘to safeguard public health’ in India,” Saha told IANS from Columbus on Friday. “The obligations imposed by the confidentiality agreement are intended to preclude improper disclosure of information obtained in the course of your work; however, they are not intended to restrict your ability to comply with your ethical obligations as a medical doctor to safeguard public health,” Palacio wrote. A team from the Department of Institutional Integrity (INT) of the World Bank came to India in March-April 2007 to investigate allegations of corruption in the distribution of HIV testing kits in different parts of India. Saha came with the World Bank team as a medical consultant from the US. Two other doctors from India were also in the World Bank team, which visited a number of hospitals and blood banks across India, including several major centres in New Delhi, Mumbai and Bangalore. The final World Bank report is yet to be released formally. The average revenue per user per month (ARPU) for GSM services has declined by 5.69 per cent even as the tele-density increased to 18.23 for the quarter ending March compared to 17.16 at the end of December. The all India blended ARPU for GSM services has declined by 5.69 per cent, from Rs 316 in the quarter ending December to Rs 298 in the current quarter, Trai said. The ARPU for the GSM postpaid service has declined by 3 per cent, from Rs 632 in December to Rs 613 in March. the ARPU for the GSM prepaid declined by 4.58 per cent from Rs 262 in December to Rs 250 in March. The All India blended ARPU (per month) for CDMA services for the quarter ending March is Rs 202 as against Rs 196 for the quarter ending December, however, registering a growth of 3.06 per cent. Monthly ARPU for the CDMA postpaid segment has declined to Rs 447 from Rs 456 in the last quarter and for the prepaid segment has increased to Rs 168 from Rs 159 in the last quarter. The gross subscriber base of the wire-line and wireless services together crossed the 200 million mark. The total number of subscribers increased from 189.92 million (in the quarter ending December) to 205.86 million (in the quarter ending March), showing an increase of 8.39 per cent during the quarter. The overall growth for the year (March to March) was 46.71 per cent. The tele-density in the quarter ending March has reached 18.23 compared to 17.16 at quarter ending December. The subscriber base for wireless services has increased from 149.62 million to 165.11 million and that of Wireline service from 40.30 million to 40.75 million. The number of public call offices (PCO) in the country has increased from 5.30 million to 5.55 million, registering a growth of 4.72 per cent in the quarter ending March. The rural wire-line subscriber base has increased from 12.48 million in the quarter ending December to 12.56 million in March, registering a growth of 0.64 per cent. The rural wireless subscriber base is 33.14 million at the end quarter ending March, it said. The number of village public telephones (VPT) in the country has increased to 5.64 lakh from 5.57 lakh registering a growth of 1.26 per cent. The Internet subscriber base at the end of quarter was 9.27 million as compared to 8.58 million during the preceding quarter registering an increase of 8.03 per cent. There are 31.30 million Internet subscribers at the end of March 2007, who are accessing Internet through mobile handset (GSM/CDMA). Bharat Sanchar Nigam Ltd. has continued to hold its top position with a market share of 45.21 per cent followed by the MTNL with 19.01 per cent of market share. The number of broadband subscribes (with a download speed of 256 Kbps or more) was 2.34 million at the end of March with a growth rate of 13.88 per cent over the previous quarter. Speaking at the Suminfra, a CII summit on Sustainable PPPs in Infrastructure here today, union urban development minister S Jaipal Reddy said BRTS could be taken up in Public-Private Partnership in India, where it could emerge as the most favoured urban transport system. He said taking the example of South American countries, it was up to the Indian cities to take up this system in conjunction with private players. Reddy said exclusive tracks for fast movement of buses could decongest roads adding that the Centre was keen to increase funding of infrastructure projects and that a metro rail would also come up in Hyderabad under the PPP model. The union minister said India was the first country to take up metro projects on PPP basis and said after the Hyderabad metro, the experiment would be tried elsewhere also. He said the government had earmarked a sum of Rs 1,00,000 crore for infrastructure development under the Jawahar Lal Nehru National Renewal Programme and that Rs 5,500 crore had already been earmarked for infrastructure projects in south India. Karnataka Chief Minister H D Kumaraswamy said the state government had proposed a number of projects in the PPP sector. He said a large 300 sq km petrochemical project was proposed for Mangalore. With a core processing area of 150 sq km, the project would be sent for sanction to the Centre shortly.